Lemuel Sawyer, 1777-1852 Autobiography of Lemuel Sawyer: Formerly Member of Congress from North Carolina. 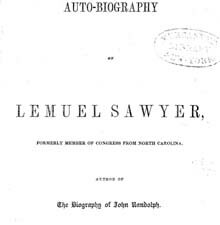 Autobiography of Lemuel Sawyer: Formerly Member of Congress from North Carolina. New York: Published for the Author, 1844. Authors, American -- North Carolina -- Biography.